...the most important meal of the day, and so, for Tuesday of Founder's Week, the Stedsmen enjoyed the "Breakfast of Princes." Princes? Yes, princes. The Founder, Fr. Sorin, referred to residents of St. Edward's as princes. As you can imagine, the reference had "staying power," and it remains with the Stedsmen to this very day. 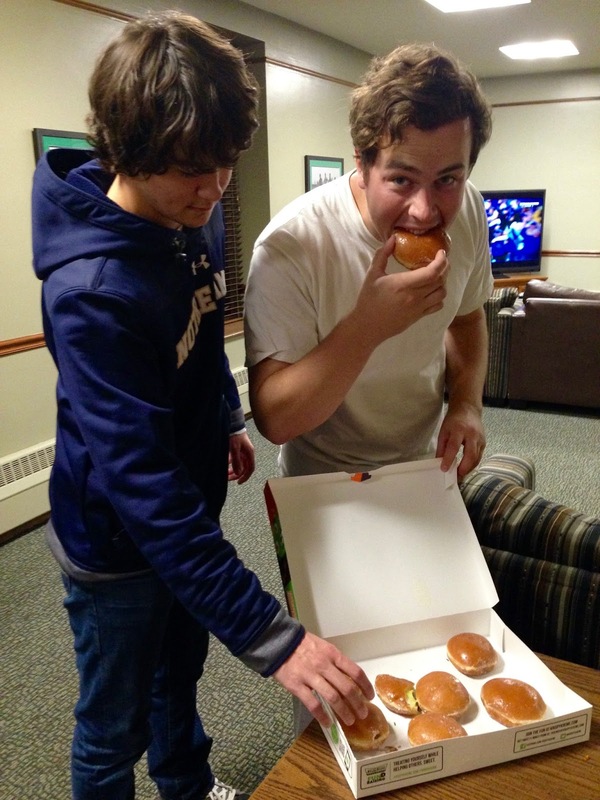 So, the Princes of St. Edward's enjoyed Krispy Kreme doughnuts and orange juice as they headed to class yesterday morning. On having their princely breakfast, Alex Schelhorn, Steds sophomore, said, "There's nothing like a great nutritious breakfast to start the day," while Jackson Herrfeldt said, "Breakfast of princes, more like Breakfast of Champions!"